For Most All Portable Sewing, Embroidery, Sergers and Blindstitch Machines. Remove Embroidery Arm, Accessory Tray, Hard Slipover Case, Thread Stand, Etc. to fit. For Brother SE350, SE400, LB6770, LB6800, PC420, NQ700-900-1300, PE700, PE750, PE770, PE780, NV1250, PQ1500S, Juki TL, HZL, Janome 1600P, 6300P, 6500P 6600P. It will NOT FIT the larger Brother embroidery machines ULT, 1500, 2500, 2800, 4000, 4500, 4750, 6000, 6700, 6750, 8500 Janome, Viking, Pfaff, and Singer Futura sewing and embroidery models with separate embroidery arm units. Bag will accommodate Brother, Babylock, and White 4x4" hoop embroidery machines, Janome and 9" arm portable sewing machine heads, if thread stands are retracted and not spools of thread on the machine . Fits All Brother 4x4" Embroidery Sewing Machines with Embroidery Arm Unit inside. Zipper Access with Sturdy Nylon Webbing Straps. I have used your Company before and have been very satisfied with your services. I was pleasantly surprised at the great quality of the product for the money. I will shop at allbrands.com again! Ihave ordered many times and been very pleased with my shipments. Fast service and you have what I want! I have made several purchases at Allbrands and I have always been completely satisfied. I won't hesitate to order from Allbrands again. Thier email response providing tracking date is excellent. I also like being able to track my shipment so I know exactly when it will arrive. I will order from Allbrands again! The soft cases that I found to store my serger machine and an extra sewing machine have been excellent. They were also an excellent bargain. The shipping was extremely quick, and it was free! Thanks for such a great product and service. The website was so warm and friendly; I intend to make other purchases from this site. We were very happy to find these bags on your web site. The price was right, the shipping was fast and and they work perfectly for our three Pfaff machines which are now with us at our winter home in Arizona! Thank You very much! Great service quick shipping. Very pleased with the whole transaction. I am a return customer. I had been looking for a tote with the dimensions to carry my Futura and yours was the only location where I could find the appropriate size for less than $200. Your price was only $30. I'm very happy with my purchase. I was impressed with quality and price as well as the service and speed of delivery. Merry Christmas, Thanks for the speedy delivery. I have always had great service with this company. Great prices and free shipping -- hard to beat that! It is perfect for me! 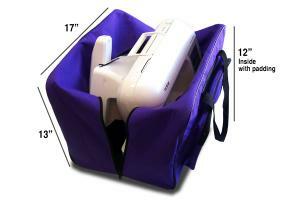 The sewing tote holds the machine and all the attachments! What a great buy. Thank you. I just wanted to give you some feedback about the Sewing/Embroidery Machine bag I just purchased from you. 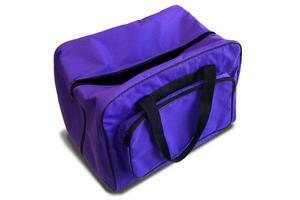 I own several embroidery machines and ordered the bag for one of my stand alone embroidery machines (White 3300). When the bag arrived, much to my surprise it was larger than I expected, so I decided to try and fit my Futura Quantum 200 in the bag. And I was able to fit the Futura machine and the embroidery unit inside this bag!!!!!! Hooray, because thus far I had not been able to find any bag at a reasonable cost that would fit the Futura Quantum Sewing/Embroidery Machine. I thought I would share this information with You in the event that other Futura owners inquired about carring cases for the Futura machine. Thank you for your wonderful service and quality product.